Coldplay's Chris Martin Once Shared a Song With Beyoncé and She Called it "Awful"
Coldplay and Beyoncé have a storied history together, having worked with together numerous times. 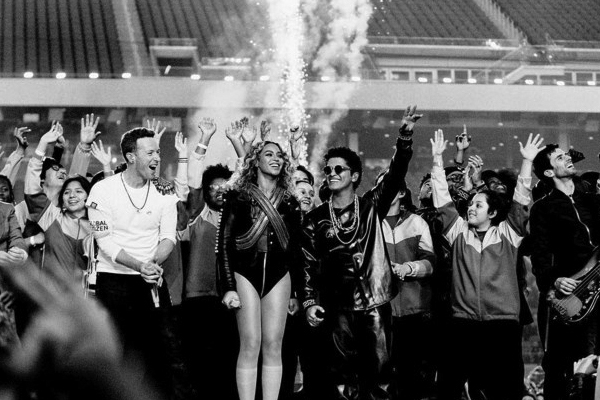 Just last night, they shared the stage, with Coldplay’s frontman Chris Martin performing alongside Beyoncé during the Super Bowl halftime show. It’s clear that the two have a friendship and general appreciation of each other’s work, and Chris Martin has revealed that Beyoncé that they’re not exactly afraid to be honest with each other, too. Martin also revealed that in the feature that he’s aware that Coldplay are a bit of a joke to some people. “I had a couple of years in the mid-2000s where it was really confusing to me. I was like, ‘Why is our band sometimes a punch line?&apos;” He also claims that he can “nae nae with the best of them,” which is a terrifying mental image.